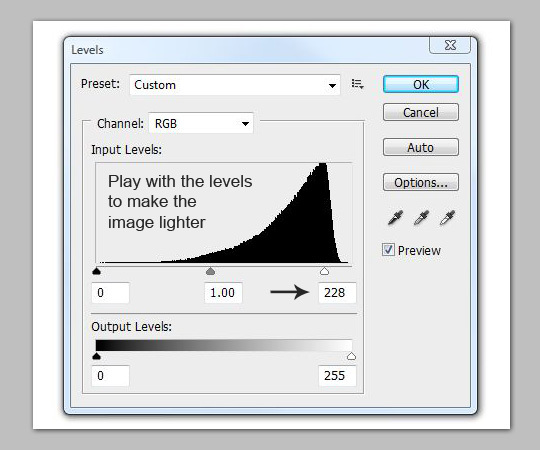 You know how in just about every Photoshop tutorial one of the first steps is to go and download a set of brushes? Well, it’s time to change that. Making your very own custom Photoshop brushes is a simple process that we can all take advantage of. In this tutorial we will focus on making a subtle textured brush, but the technique is the same for any type of brush that you’re after. Subtle or soft textured brushes are great for adding a little character to designs. While there are probably a hundred different ways to make subtle textured brushes, the technique that I’ll present here is pretty quick and easy. You’ll need to start by finding the perfect image. Perfect is a pretty relative term isn’t it? Look for something that represents the style that you’re after. Could be an aged look, something with some cracks or maybe a fabric type texture. In this tutorial we will hunt down a canvas texture with a little grunge appeal and work off of that. Note: If you’re following along with this same image you’ll notice that the dimensions are 1575 x 2200 px, much larger than the screenshot images. 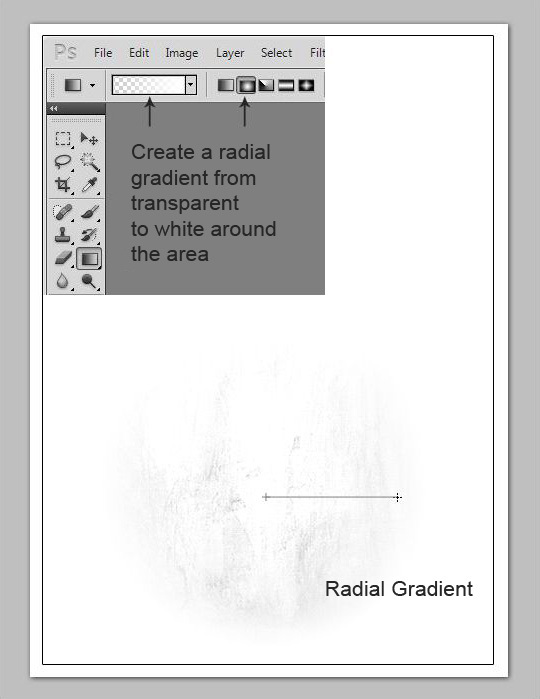 Now, grab the gradient tool and place a radial gradient from transparent to white over the part of the image that you wish to turn into a brush. If you want more of a square brush, use the linear gradient to peel away what you don’t need. 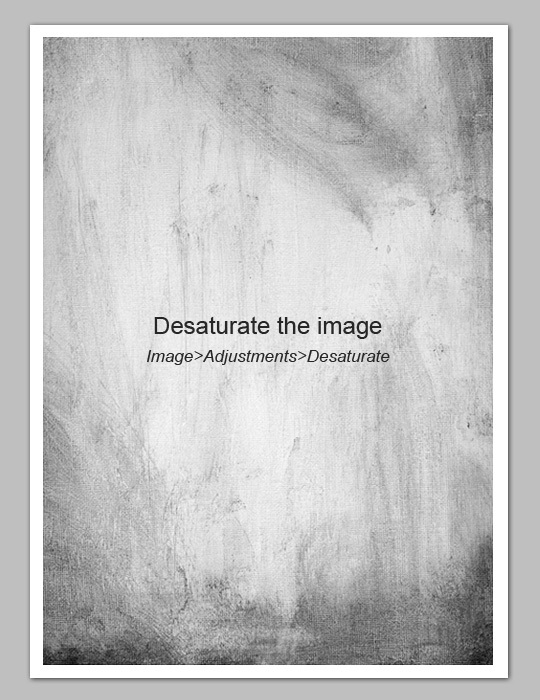 The idea is to eliminate the parts of the image that you won’t be using. Don’t worry if you don’t get it right the first time, just hit Ctrl (Cmd) + Z to start over. Note: It may be difficult to see the canvas texture in the screenshot below, being a subtle brush it is very faint. If you don’t see anything, try playing around with the contrast and brightness settings on your monitor. Almost done! 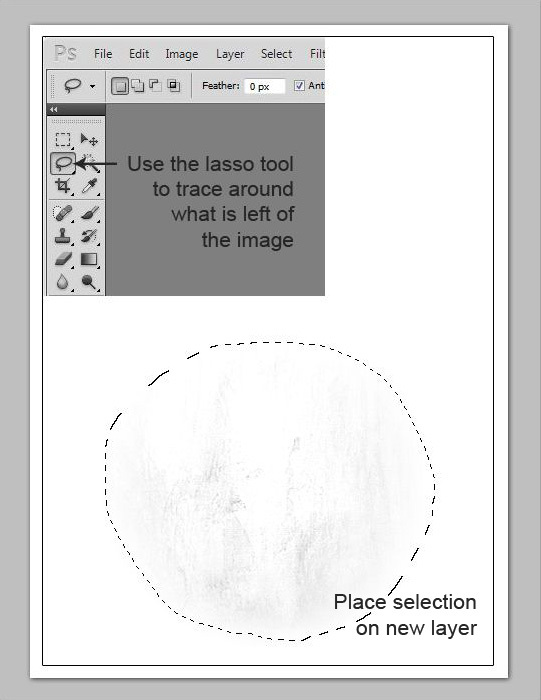 Take your lasso tool and outline the good stuff. Once you’re satisfied, place the selection on a new layer (right-click>layer via copy). Let’s turn this into a brush. With your new layer selected, go to Select>All from the menu bar. A dotted line outlining the project will indicate that it is selected. Then choose Edit>Define Brush Preset… and name your new brush. Congratulations, you have just successfully made a subtle textured brush in Photoshop. 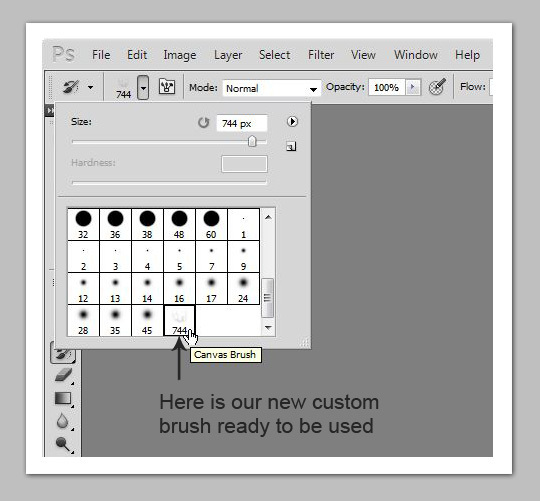 Access your new brush by grabbing the brush tool or eraser tool and then clicking the drop-down option for the brushes. Your new brush should be the last one at the bottom of the collection. Let’s put this baby to work. The examples below were made using a brush following the exact steps above. 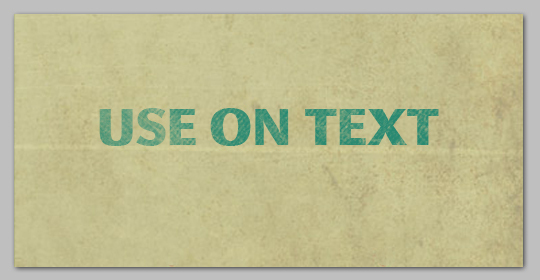 You can use it to add an instant subtle grunge texture to backgrounds. Here I’ve used the brush as an eraser to chip away at the text and blend it into the background. Brushes are a great resource for adding subtle effects and textures to graphic design work. Of course you can use Photoshop brushes however you wish, but here are a few tips to help you get the most out of them. So if you didn’t already know how, you can now go out there and start making your own custom Photoshop brushes. If you enjoyed the tutorial or have some of your own tips to share, I’d love to hear your thoughts in the comment section. Thanks! Great tutorial! I use brushes all of the time and like you said, it seems like every tutorial requires you to download them. I didn’t know it could be so easy to make your own. Thanks! Nice brush and tutorial. Thanks for the resources! Nice approach to making brushes. I love the technique. 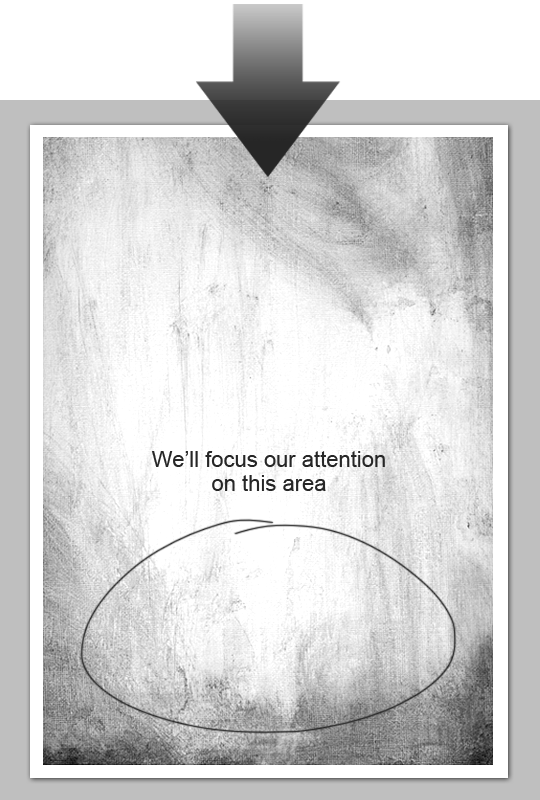 Subtle brushes come in handy in almost all of print design. Thanks for the tutorial! Yay! Now I can make brushes. Great tutorial Shawn! Awesome tutorial and great outcome! Subtleness is a key player in design. Very simple tutorial. Nice job! 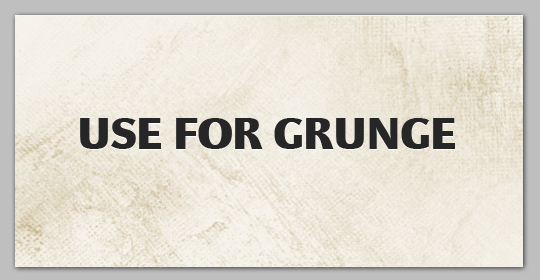 Thanks so much for this excellent tutorial. I’ve used it to create my own textured Photoshop brushes for my children’s book projects. Thank you!